8 x 10 foot custom order “Wildlife” floorcloth for a dining room setting! 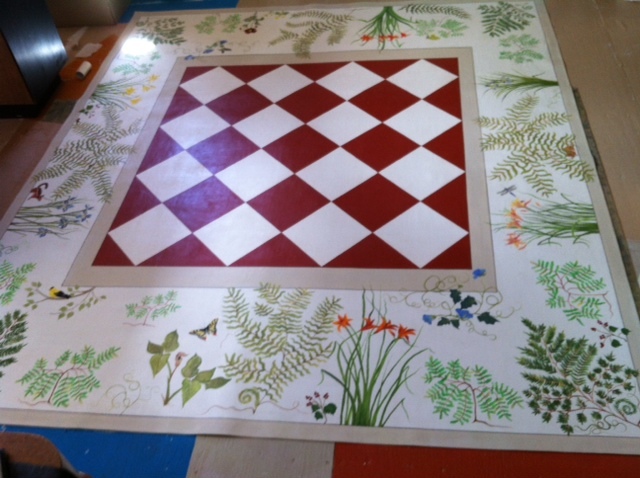 Painted floor cloths is both an Art and Craft. Floor cloths originated along the New England seacoast in the 1700s. They used old sails from ships. The process has developed over the years. Original floor cloths were made from old sails, painted with oil paints and sealed with shellac. Some of these original rugs can be seen in museums along the New England seacoast still! Today, they are made from heavy canvas, painted with acrylics and latex paints, and finished with several coats of water-based polyurethane.  Seal the floor cloth. Allowing at least 24 hours before you apply clear polyurethane finish.  Allow at least 12 hours between coats of finish and apply 3 to 4 coats.